Short Character Description: An attractive black and white tuxedo cat with bright yellow eyes. Nightflower is known for being quite pretty. Her fur follows a tuxedo pattern, black with white front paws, chest, belly, and muzzle. It's about medium in length and as soft as it can be for a feral cat. She keeps it well-groomed, and rarely has a hair out of place when not in battle. For a female cat, she's large, and tends to keep a stiff posture that allows her to tower over smaller cats. Her eyes are bright, almost golden yellow. Nightflower is known for being a no-nonsense cat, strict and stern in everything she does. She is used to getting her way by sheer force of will, although she also tends to respect rank, and tends to go along with whatever those in authority want. However, if she does disagree with those in command, they are almost guaranteed to hear from her. Other than that, Nightflower tends to be rather reserved. She prefers to listen to others than talk about herself, and will often lurk on the edge of group conversations. Despite this, she finds gossip silly, and prefers to keep conversations on practical matters. Her temper is fairly short, and although she rarely truly loses her temper, it doesn't take much for her to get snappish at others. Nightflower has very little sense of humor, and tends to be rather composed. It is difficult to get her to display any sort of emotion besides annoyance. She keeps carefully formal, rarely relaxing around other cats. Despite all of this, she is fiercely devoted to her clan, and every cat in it. Even though she has no patience for other cats' mistakes, this is more due to her holding them to a high standard than anything else. She would die for the sake of the clan, especially those in the nursery. There is nothing she loves more than kits, even those that aren't hers, and she respects and admires queens more than any other cat. Kits are the only ones that she'll act even the slightest bit silly with. If someone tries to point this out, however, Nightflower will immediately deny it. 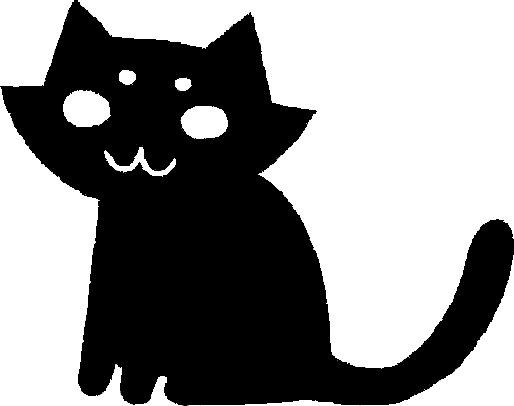 Nightflower believes in Starclan, but doesn't concern herself much with them. She believes that that's business for the medicine cat and leaders, and that signs and prophecies are matters left to them. When she dies she'll join the warriors up there, but until then she will give them the respect they are due and not worry about it. Being a practical cat, she pays little heed to superstitions and dislikes most of the stories queens tell their kits, as she considers them tales to scare kits into behaving and distract them from more important matters. Thus, she tends to dismiss them out of hand. Skill-wise, Nightflower is about average in everything. She's not very agile and prefers to stay away from trees, but she can hunt, run, and track as well as the next warrior. In battle, she tends to hang back and avoid fighting as much as she can, although she can hold her own fairly well. If the nursery is threatened in any way, shape, or form, however, she becomes a terror on the battlefield, capable of taking down warriors much stronger than herself in her fury and not giving up until she is long dead. Her true talent lies in mothering, as she can soothe unruly kits and teach them the basics of life they'll need before apprenticeship with the best of them. For her, the young (including apprentices, although she favors kits over them) are more important than anything else, and she would give her life for them. Her pride may not allow her to seek help with them unless she is in dire need of it, but that is a rare occurrence. Nightflower was the only daughter of the warriors Swallowtail and Loonface. By the time that Swallowtail had given birth, they had lost interest in one another, and separated on good terms. Loonface had almost nothing to do with raising his daughter, and Swallowtail didn't tell Nightkit about him until she was almost out of the nursery. Instead, she practically smothered her daughter with her love, even as she sternly taught her to behave. After six moons of life, her mentor, Falconheart, only reinforced Swallowtail's teachings. The two she-cats especially taught her to honor and protect the nursery, and she started to gravitate back towards it. Nightpaw was excellent with kits, even as she took no nonsense from them. Thus, when she completed her training, her leader gave her the suffix -flower for the motherly potential she showed. Nightflower was fairly popular in the clan, earning the attention of couple different toms interested in her. By the time she was 13 moons she had chosen a mate, although they never went public with their relationship, so no one knows who he is besides the two of them. She went through a normal pregnancy, and had a litter of normal and healthy kits. Yeah, she's going up so that people can see her if they're interested in playing her kits? I dunno, just delaying typing up Lightnose because he's overly angsty, and I should probably finish her before Rabbitstep. Nightflower won't get played until she has at least two kits, so tell me if you want one, and as long as you follow the basic guidelines that I have now given for what her kits would be like, it's yours. I was thinking they would be about 12 weeks old(3 moons) so their eyes are already at their adult color and stuff like that, but I can change that. Also, tried something new with formatting. What do you think? Same name principle applies here, and her mate is the hypothetical Leopardstorm that is now my name so I'm not using him. Perhaps Speckleclaw or Fleckstorm.